Robbie Conal’s ‘Cabinet of Horrors’ to Open at Track 16 Gallery October 13th: Achtung Baby! 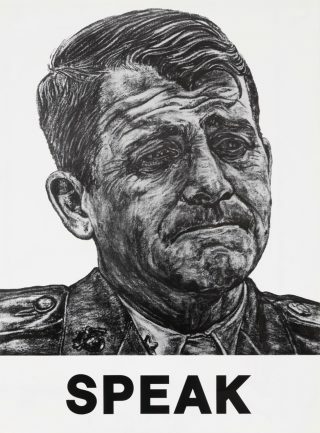 Guerrilla artist Robbie Conal introduced himself to Los Angeles in the mid-80s with a series of intense black and white portraits lambasting the Reagan administration for the Iran-Contra Affair. The posters seemed to come from nowhere, suddenly flooding the streets with political bravado. I remember the Oliver North “Speak” image as being particularly biting. If you could find a poster that was not well glued, it was a huge score. I, myself, was the proud owner of the Bush/Quail poster, Plan Ahead. Maybe in the history of art, including graffiti and cave drawings, Conal was not the first guerilla artist, but I believe the moniker was invented especially for him. Conal’s original artwork is done with oil paint, but the brushstrokes are so ferocious and the images so unforgiving, that they remind me of Ralph Steadman’s ink drawings. The posters often illuminate hypocrisy and greed, confronting the evil you sense but cannot name. Through the years, Conal has not let up, adding color (especially red) to his posters, which have featured both heroes and villains, including Nelson Mandela, Newt Gingrich, Pete Wilson, Clarence Thomas, Ghandi, and Bill Gates. But the corrupt Trump administration has been especially inspirational for Conal, making his revealing and accusatory posters explode all around the city and all over the nation. Track 16 Gallery in DTLA will be presenting “Robbie Conal’s Cabinet of Horrors” from October 13 to November 10, 2018. 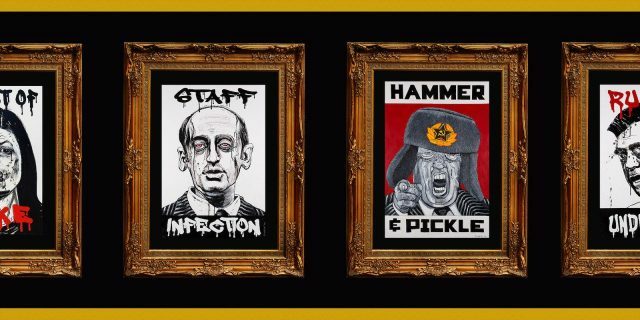 The collection of approximately two dozen original paintings skewering Trump and his official cabinet monsters members, including Secretary of Education Betsy DeVos, and Rudy Giuliani. Of course, no one can promise that any of the cabinet members are still in office, or will still be there when the show closes. We just can’t keep up with this fickle president and his tempestuous relationships. Get out to Track 15 Gallery and change your situation. Opening Reception Saturday, October 13, 2018, from 7-10 p.m.
Artist’s Talk: Thursday, October 25, 2018, 7 p.m. This entry was posted in Art, Upcoming Events and tagged Guerrilla art, Guerrilla artist, Guerrilla Etiquette + Postering Techniques, Robbie Conal, Track 16 Gallery. Bookmark the permalink.